To ensure a smooth airport experience for you and your passengers, make sure to familiarize yourself with the rules below. Lyft is available at the following airports in Georgia. Drivers on the Lyft platform are responsible for knowing and following all airport regulations in order to avoid receiving administrative citations from the airport. Effective 01/01/2019: As a Lyft driver, you are only allowed to pick up at ATL airport if your vehicle’s age is 2012 or newer, and you have an airport placard. If your vehicle is 2011 or older, you can continue dropping off passengers at ATL as usual — just do not enter the airport staging lot & pickup queue so that you don’t give airport pickups and risk deactivation. ATL Airport will issue citations to drivers who do not follow these rules. You are responsible for paying any tickets you receive for violating airport rules and regulations. Wait in the designated staging area. Only drivers within the designated staging area (1586 Sullivan Rd, College Park, GA 30337) are added to the queue. Beginning 6/11/2018, the staging area will be closed daily from 3am - 4am so that it can be cleaned. Please vacate the staging area during this time so that airport staff has the space to clean the lot. Domestic Terminal: All designated Rideshare pickup areas are at North and South Economy Lots. Enter through far left lane for the North Lot. Enter through far right lane for the South Lot. Beginning 12/22/18, the pickup area for the North Lot will move to a designated pickup lane west of the parking garage (previously north). You must have your airport hangtag visibly displayed on rearview mirror prior to entering lot. When entering the lot, press red button and pull a parking ticket. Once you enter the lot, you must proceed to the designated Rideshare pickup area. The pickup area is active loading only — no parking. Once you have picked up your passenger, proceed to exit through a “Credit Card/Prepaid Ticket” lane. Credit cards are the only accepted form of payment at “Credit Card/Prepaid Ticket” lanes. Insert your parking ticket to exit parking lot. If within grace period, no payment is required. If grace period ends, you will be responsible for ALL parking fees: $3 per hour up to the daily max of $14 per day. If your parking ticket is lost or damaged, you must utilize a Cashier lane. International Terminal: Pick up passengers from Arrivals. Do not pick up passengers at the Domestic Terminal curbside terminal entrance. Do not wait or circle back at the airport if the passenger is delayed when picking up. Head to the Staging Lot and wait there. Drop off passengers at Departures, at your passenger’s carrier of choice. Do not wait at the airport terminal after drop-off. Instead, proceed to the Staging Lot. 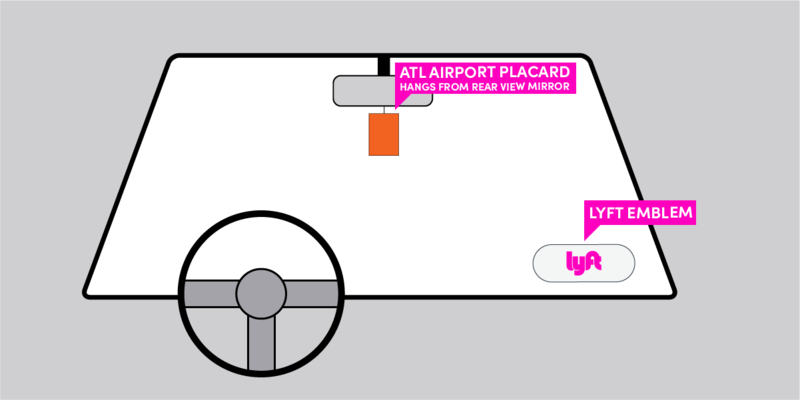 In addition to your Lyft emblem, you are required to display an airport placard in your vehicle when giving rides at ATL airport. In order to receive your ATL Placard, your vehicle age must be 2011 or newer. If you've just been approved to drive, you should receive your placard shortly. Drivers in Atlanta are welcome to come to the Lyft Hub for in-person support or to get a replacement airport placard or Lyft emblem. Our Hub is located at 814 Bellemeade Ave. Atlanta, GA 30318. Hours may vary. Wait in the designated staging area off of Crossroads Parkway. Only drivers within the designated staging area are added to the queue. Pick up passengers from the passenger loading area in the lot north of the terminal. As a reminder, you may not pass out referral cards or promotional materials while on airport property. Wait in the designated staging area pictured above. Only drivers within the designated staging area (pictured above) are added to the queue. Do not wait at the airport terminal or accept additional ride requests after drop-off. If you'd like to accept additional requests, head to the staging area.